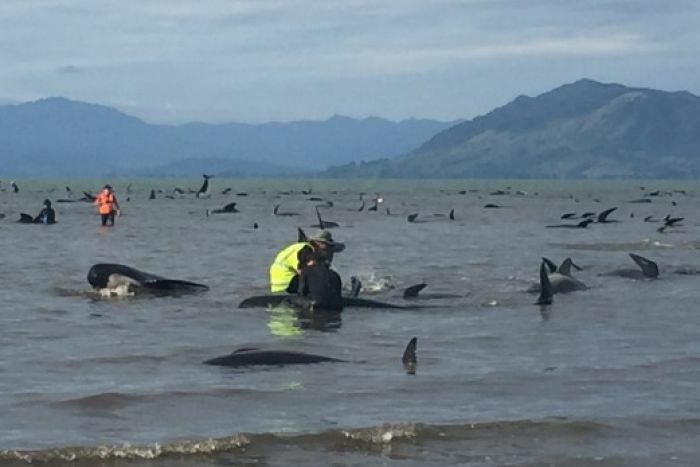 An absolute disaster has struck New Zealand after around 400 whales were found thrashing tales in distress and stranded on a beach on Thursday causing the death of around 300 whales, the situation worsened this morning when another 240 arrived in the same place causing more chaos for the many volunteers trying desperately to refloat the desperate whales. 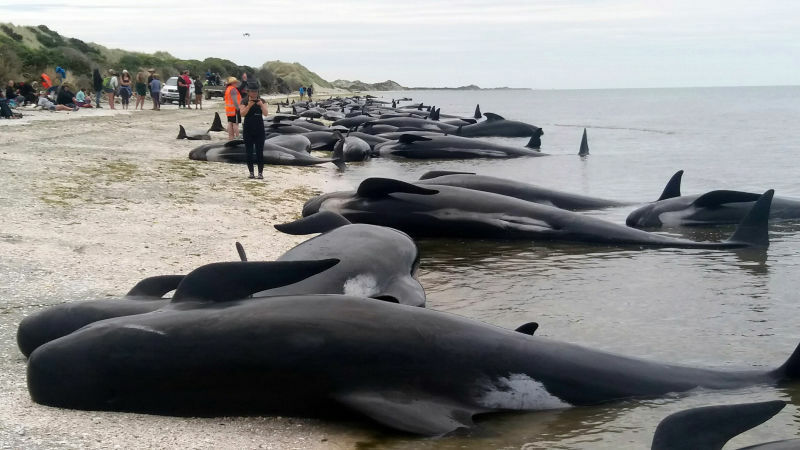 Earlier on Saturday, volunteers had refloated some 100 of the more than 400 pilot whales which beached on Thursday. But a human chain, with volunteers wading neck-deep into the water, failed to prevent a fresh pod making landfall. The stranding now involving around 640 whales is thought to be one of the worst ever in the world. It is hoped that those of the new arrivals that survive can be moved back out to sea during the next high tide in daylight on Sunday. 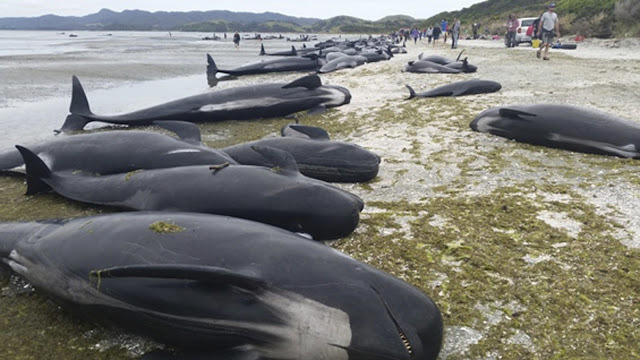 It is not clear why the whales continue to arrive on the 5km-long (three miles-long) beach next to Golden Bay. Herb Christophers of New Zealand's department of conservation told the BBC that the whales were trying to get round the top of South Island, but if their navigation went wrong they ended up on the beach. In the shallower waters, the animals' use of echolocation was impaired. oh it is getting serious.The Bible prophesies this.1/3 of the sea,plant and animals along with people.Earthquakes,famines, wars and rumors of wars.These are the signs that the end is drawing near.Time to follow Jesus.Time to get your spiritual house in order.300 tons of radioactive waste a day flowing into the oceans just from Fukushima.10000 Becquerel's per liter of water of Cesium-137.3 billions Becquerel per day of just Cesium-137.There are mox fuel rods that contain plutonium.The most dangerous element on our planet.Its been dumping in our oceans for almost 6 years.That is only one source of pollution.Sealife,plants and animals are dying all over the world.Think its time for concern???? I do. Sonic Sea is a recent documenary by scientists trying to inform the public of what is going on, besides the pollution.